Okay, seriously, if you cut the crappy filler story out of last weeks episode, and this weeks episode, you would have had 1 short episode. Don’t get me wrong, I really liked the Dr Crane, and his son Jonathan story line. It is a great story line about what turned Jonathan Crane into the vicious killer we later call Scarecrow. If the show would have spent a little more time investigating Dr. Crane’s killings, and maybe even a little more time flushing out the Bullock romance (who is mysteriously missing from this installment), they could have made one great episode with this story line. Unfortunately, they filled the episode with useless crap. 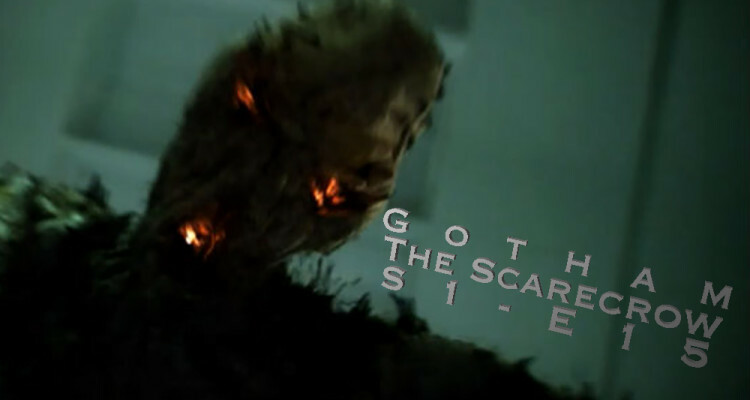 The Scarecrow portion of this episode was the third act of last weeks Dr Crane storyline. It was barely there. The episode begins with another murder. Again, the adrenal glands are removed. Bullock identifies Dr. Crane in a school book as a biology professor, and they go and talk to his former employer. 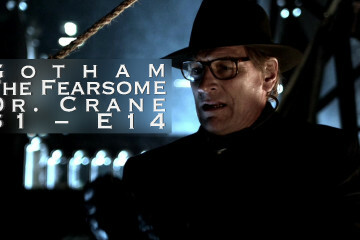 Eventually, they discover that Crane’s wife died in a house fire while Dr. Crane and his son were in the house. They escaped, she did not. They decide to go check out that house. At Dr. Cranes former residence, we see that he has been shooting up with his concoction made from pulverized adrenal glands. Once the drug takes affect, he has vivid hallucinations of his wife burning. Eventually, this alleviates Dr. Crane’s fears, and he starts shooting up his son Jonathan so he can “cure” him of fear as well. This is when Gordon and Bullock arrive. Dr. Crane and Jonathan escape out the back, and Jonathan gets his large shot of adrenal junk in a field underneath an ominous scarecrow. Gordon and Bullock confront Dr. Crane who is now without fear. He attacks Bullock and Gordon, and they shoot him (sometimes fear is a good thing, it keeps you alive). Meanwhile, Jonathan Crane is overdosing on adrenal junk and seeing the scarecrow come to life. Paramedics stabilize Jonathan, but his brain is damaged. The doctors tell Gordon that his brain is switched on in a permanent state of terror. 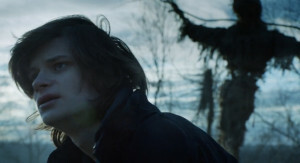 From Jonathans perspective, we see his hallucination of the scarecrow continues to torment him. All of this takes up minimal screen time, yet should have been the majority of the show. Instead, we are deluged by filler story from the season arc. Fish Mooney is still locked up, and still trying to take over. It seems pointless to be in charge of a bunch of people that are locked up. The head slave is still a slave. I really wish Fish would die already… Isn’t Victor Zsasz still looking for her? Why isn’t Falcone demanding that she die? We see a lot of Falcone this episode. He is calm, and collected as he discusses with Maroni the fate of Penguin. Maroni obviously wants Penguin dead, and Falcone wants to keep him around. They come to an agreement. Penguin is trying to re-open Fish Mooney’s bar under the name Oswald’s. This leads to one of the better scenes in the useless season arc storyline as Penguin goes to GCPD to deliver an invitation to the grand opening of his club to Gordon. 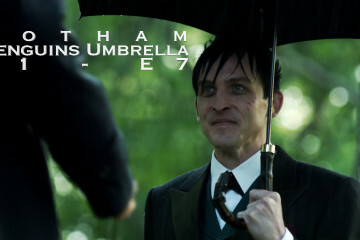 While there, he runs into Ed Nygma. 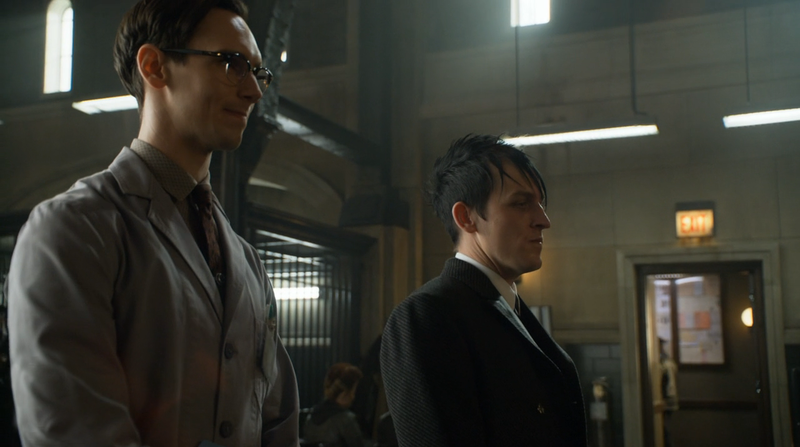 This awkward meeting between the Penguin and the Riddler was fun. Also in this episode we see Bruce Wayne head off into the woods to continue a tradition he and his father had. While there, he falls down a hill and sprains his ankle. I was expecting this to be the time when Bruce falls into the cave that becomes the Bat Cave, and has his first encounter with the bats… it wasn’t. Instead, Bruce splints his leg, and climbs back up the hill. At the top, he finds Alfred having a cup of tea. 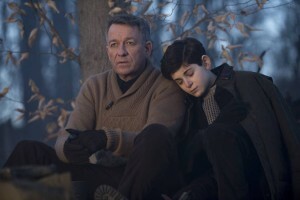 This is a neat scene because it begins to establish Alfred’s custom of being there for Bruce, while still allowing him to do what he needs to do alone. There is still a lot to like in Gotham, but there is a lot to dislike. The Scarecrow has some of the better elements of using Jim Gordon’s cop stories to expand the history of the Batman universe. But the show still tends to get away from the fact that this is Jim Gordons story. Couldn’t we hear all about Falcone and Maroni and Fish Mooney in dialog while Gordon and Bullock are on a stakeout? That seems better to me.